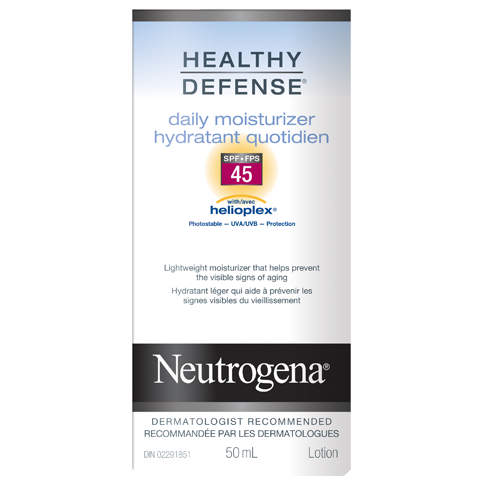 NEUTROGENA® HEALTHY DEFENSE® SPF 45 Daily Moisturizer with HELIOPLEX® technology offers photostable, broad spectrum SPF 45 protection against incidental sun exposure. HELIOPLEX® technology stabilizes the sunscreen filters that protect against UVA and UVB rays. The sun may cause sunburn, premature aging of the skin and skin cancer. Avoiding the sun, wearing protective clothing and regular use of sunscreens over the years may reduce the chance of these harmful effects. Apply generously prior to sun exposure, every morning on face, neck and other exposed areas. Works well alone or under make-up. Non-medicinal Ingredients: Ascorbic Acid, Behenyl Alcohol, Benzyl Alcohol, BHT, Caprylyl Methicone, Cetearyl Alcohol, Cetearyl Glucoside, Diethylhexyl 2,6-Naphthalate, Dimethicone, Disodium EDTA, Ethylhexylglycerin, Glycerin, Glyceryl Stearate, Hydrogenated Palm Glycerides, Methylisothiazolinone, Methylparaben, Pantothenic Acid, PEG-100 Stearate, Polymethyl Methacrylate, Potassium Cetyl Phosphate, Propylparaben, Retinyl Palmitate, Styrene/Acrylates Copolymer, Tocopherol, Tocopheryl Acetate, Trisiloxane, Water (eau), Xanthan Gum. Tried this because I ran out of my usual moisturizer, and I ended up loving this so much more! It is incredibly moisturizing but not greasy. 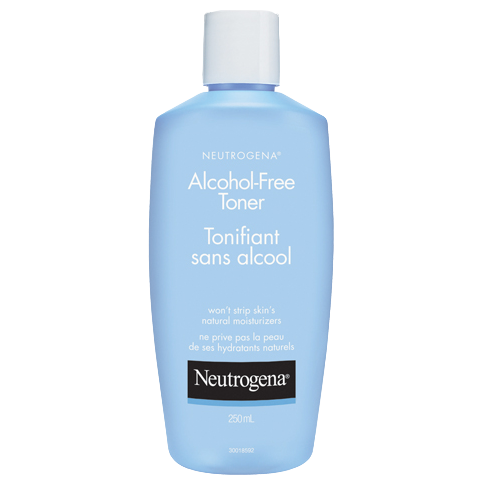 I have extremely sensitive skin, and has never reacted to this product. I love it! Received a sample and was very surprised. I have Roseace and this cream moisturized my dry skin and did not aggravate my skin condition. 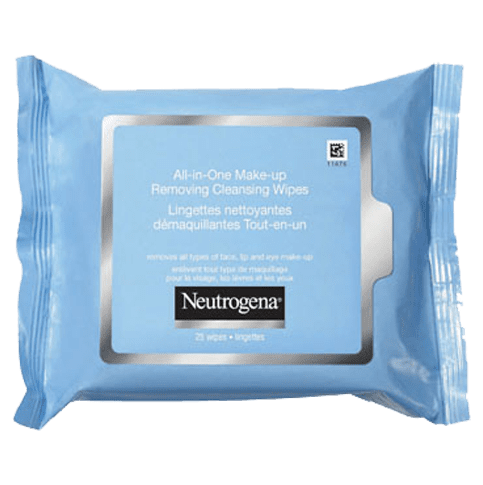 Im looking forward to trying more products by Neutrogena. 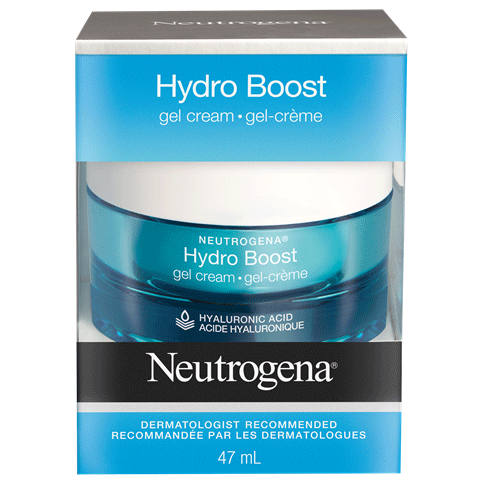 I recently received this as a sample from Neutrogena during their sample campaign. The product spreads well, has a good slip so it's great particularly for dry skin. It is not oily by any means. If anything, I would use the word "moisturizing" to describe it. As you wear it, you can feel the cream on your face but it's not something that will bother you a whole lot by any means. Has a pleasant scent. Since it's a moisturizing product, I would not recommend this to those that are on the oily side. I wore this underneath makeup and it wore well. But perhaps during the warmer months, this may not be suitable unless you have very dry skin. Your makeup won't melt quickly, but I would recommend their Beach Defense for the summer months, as that product is more suited for the warmer season. I think every product has its unique features and you just have to get to know what they are and adjust your routine so you can maximize the assets that each product has. I would recommend this product to people who tend to have dry skin, whether it be being dry during the winter months only or dry all year round. This fantastic moisturizer provides high SPF protection without clogging my pores and blends wonderfully into the skin. There is no ash or heavy residue. Also I've put it on top of other treatments with issue. My sunscreen of choice! 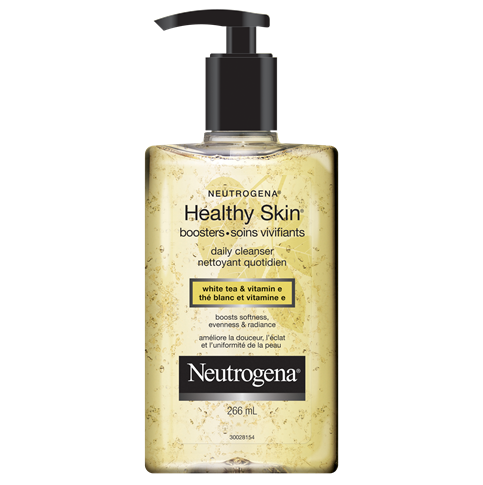 I use this product daily - goes on easy, non-greasy, and great protection for sensitive skin.